Cape Verde is known for their morabeza or hospitality. Often this hospitality extends far behind a warm smile and greeting. 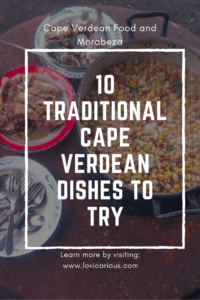 Cape Verdeans are eager to share with you their culture, history, and most of all their delicious food. 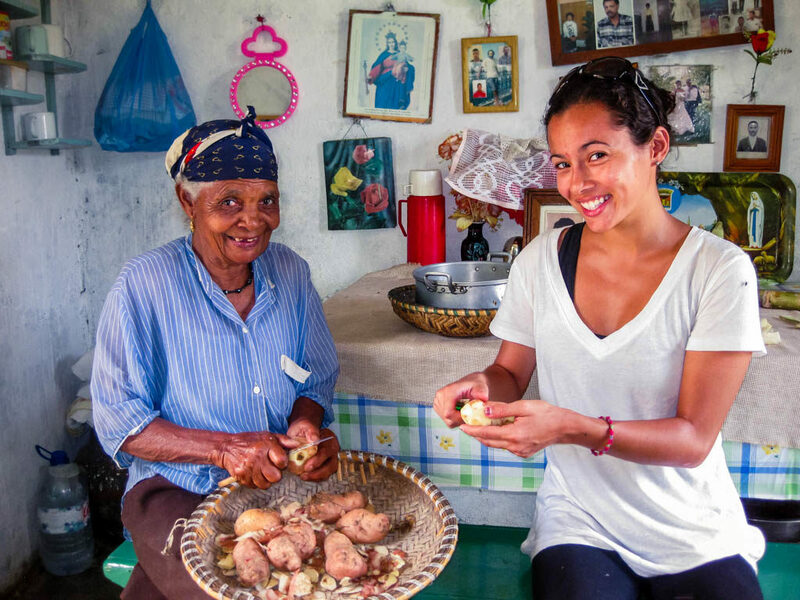 I lived on the Cape Verdean island of Santo Antão for two years as a Peace Corps volunteer. Although the dishes vary slightly depending on the island, I gained a pretty good sense of their traditional food and beverages. Below are some of the typical dishes which you absolutely must try when you visit the islands. Trust me, they are delicious and you won’t be disappointed! Cachupa is the official national dish of Cape Verde, consisting mainly of beans and corn (maize). There are different variations depending on the time of day and the occasion. Cassava, sweet potatoes and 1 kind of meat (chicken, pork, beef, goat, or fish) are generally added to the dish. Cachupa “Rica” adds in even more meat and ingredients. 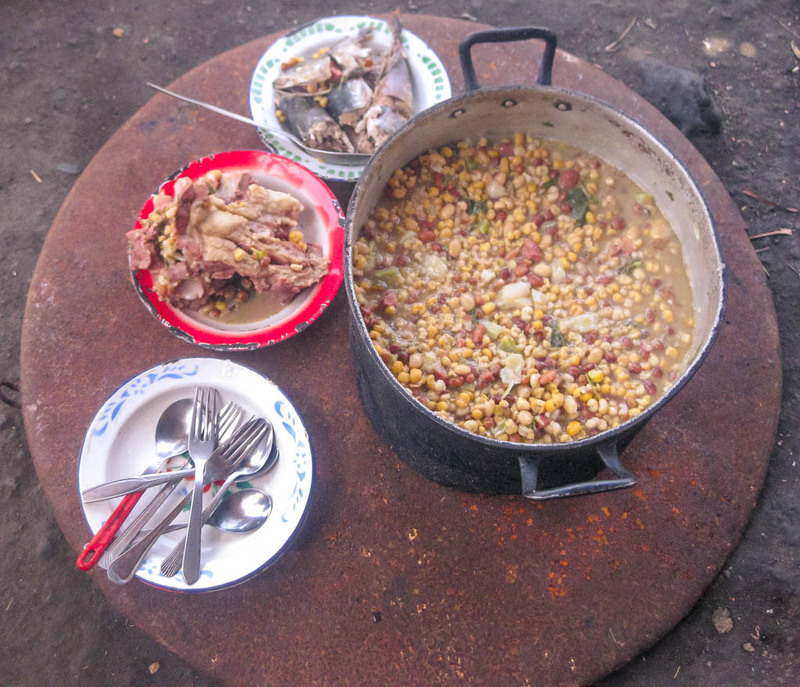 Cachupa is not only a traditional dish but a traditional cooking process. For generations, women have woken up early in the morning to “cotchi” the corn, and spend all day attending the pot while socializing with friends and family. The corn is placed into a pilon (giant mortar and pestle), and it is pounded until all of the flour is loosened from the corn. This process of pounding is called “cotchi”. The flour is removed, and the maize is placed in a pot with the beans to cook over the fire. Eventually, the other ingredients are added in. The maize is placed into a pilon to be “cotchid“, a traditional process of preparing the corn for Cachupa. Served fresh from the pot, Cachupa is soupy and makes for an excellent dinner. In the morning, it is typical to strain out the Cachupa from the broth, fry it in a pan, and serve with a fried egg. Both ways are quite tasty, and might I say, fried Cachupa in the morning is THE BEST hangover food. Cachupa straight from the fire, served with stewed pork and fish. Perhaps influenced by the Brazilian or Portuguese versions of the dish, Cape Verdean Feijoada is a slow-cooked bean stew. The type of beans used vary, although they are usually some kind of red bean, congo bean or pigeon pea. Chunks of meat (usually chicken, beef or pork) are thrown in, along with kale, and diced carrot. It is delicious served over rice. 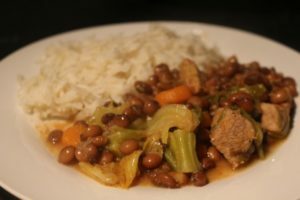 Cape Verdean Feijoada. Source: Criola Cozinha. 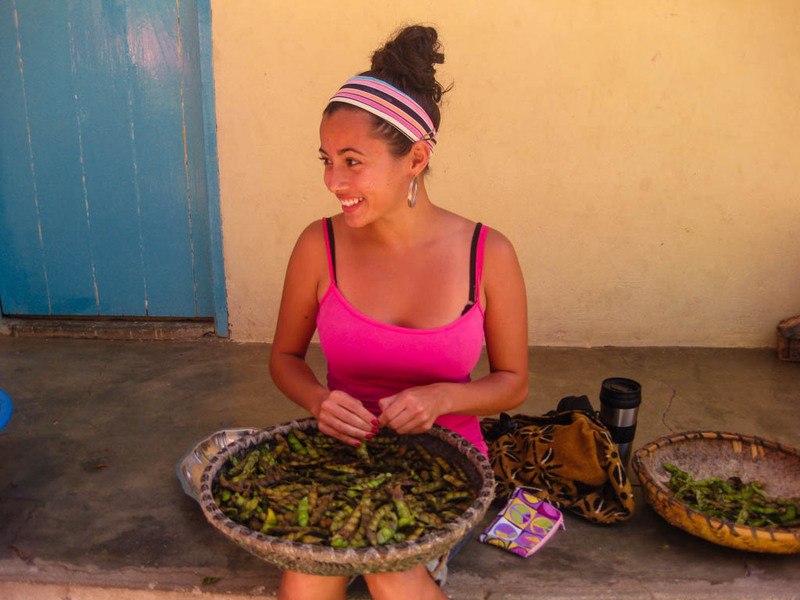 Feijao Verde is a seasonal dish available only when the pigeon peas are still green as opposed to dried. This again is a very traditional dish. I remember sitting on my neighbor’s front porch on many mornings to help her casca feijao or peel the beans from their shell. The beans are then thrown into a pot and cooked very much like Feijoada. To “Casca Feijao” is an almost daily activity during the spring and summer seasons. Being a chain of islands, it is not surprising that one of the national dishes is a fish stew. Fish (usually mackerel) is stewed along with bell peppers, sweet potato, white potato, cabbage, green banana, onions, and tomato. After simmering for half an hour, the ingredients are drained from the broth and served over white rice. The broth is poured into a separate cup and sipped during the meal. Caldo do Peixe is a popular dish although not my personal favorite. Fish soup is just not a personal preference of mine unless it is bouillabaisse from Marseille. Now this one is for the adventurous, considering I’m still not actually sure what is in it. As I mentioned, this is a local dish served in the rural villages. It is unlikely that you will find it on the menu at restaurants. If you do have the opportunity to try Papa com Frisnot, just try it! It is different than anything I have ever tasted and by far my favorite dish in Cape Verde. For such a small dish, it is packed with incredible savory flavor. Cuscus de Terra is not at all like Mediterranean couscous. Rather, this is a breakfast bread made from a mixture of corn flour and mandioc flour. A hint of cinnamon, nutmeg, and sugar can be added in for flavor. The flour is mixed together and placed into a special clay pot called a bindo, which is then set over a pot of boiling water to steam. 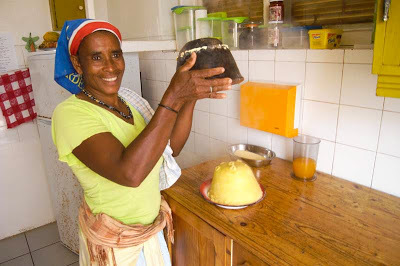 The cornbread-like cuscus is then popped out of the clay pot, cut into slices and served warm with honey, butter, or condensed milk. It can also be crumbled into a bowl with milk and eaten like oatmeal. It may not be as complex or visually impressive as a Full English Breakfast, however, it is a very traditional Cape Verdean breakfast. Making Cuscus de Terra. Photo Cred: Cape Verde Nature Adventure. 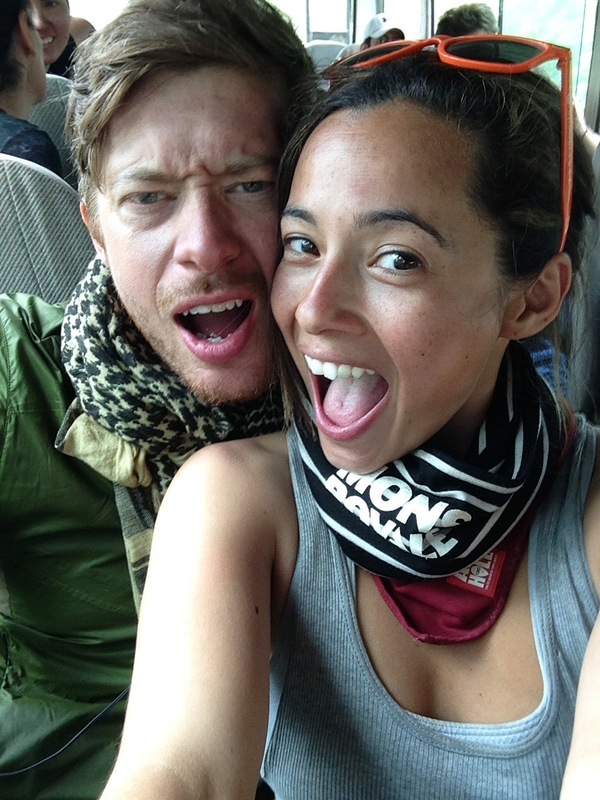 Bafas are found at most any festival or bar. They are also commonly sold by women in the street for only a few escudos. Morreia is a big meaty piece of eel, battered and deep fried. Delicious. No other description needed. Oh, but watch out for bones! These little corn dog-looking snacks are basically a hybrid of cornbread and banana bread. Corn flour is mixed together with banana and other ingredients, rolled into a long shape, and deep fried. Pastels are little moon-shaped pastries filled with fish or chicken. The dough is fried crispy, similar to that of an egg roll. Pastels are to Cape Verde, what empanadas are to Latin America. The crisp outside of a Cape Verdean pastel combined with the savory filling make for one addicting snack. Source : Criola Cozinha. Rissóis are similar to pastels both in look and taste but are made with a different kind of dough. 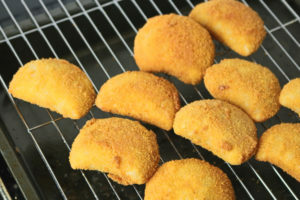 Before being fried, the rissóis are dipped in milk and breaded giving them a slightly different texture. 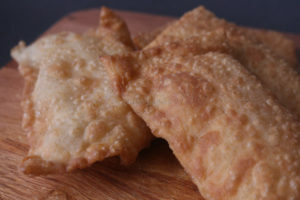 Cape Verdean Rissois. Source : Criola Cozinha. Grogue is a local rum made from sugar cane. It is not exactly something that you would want to sip casually like a fine bourbon however, it does make for a good Grogue & Coke. 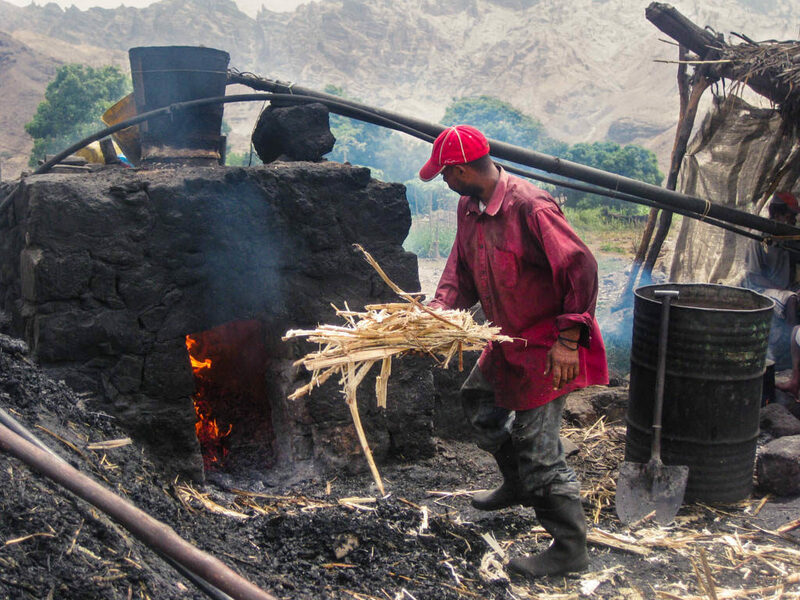 Cape Verdean grogue is made in a trapiche, where the sugar cane juice is extracted, fermented and distilled. Ponche is grogue’s best friend. The most common type of ponche you can find is ponche de mel, a mixture of grogue and sugar cane molasses. It is extremely sweet and tastes like…well, it tastes a lot like molasses. Other types of ponche that you can find include ponche de bolacha (cookie flavored), moranga (strawberry), coco (coconut) and coca (chocolate). While you can find the bottled versions in some larger supermarkets, the best will always come home-made from your neighbor or the tiny roadside stops. Cape Verde is a beautiful country. 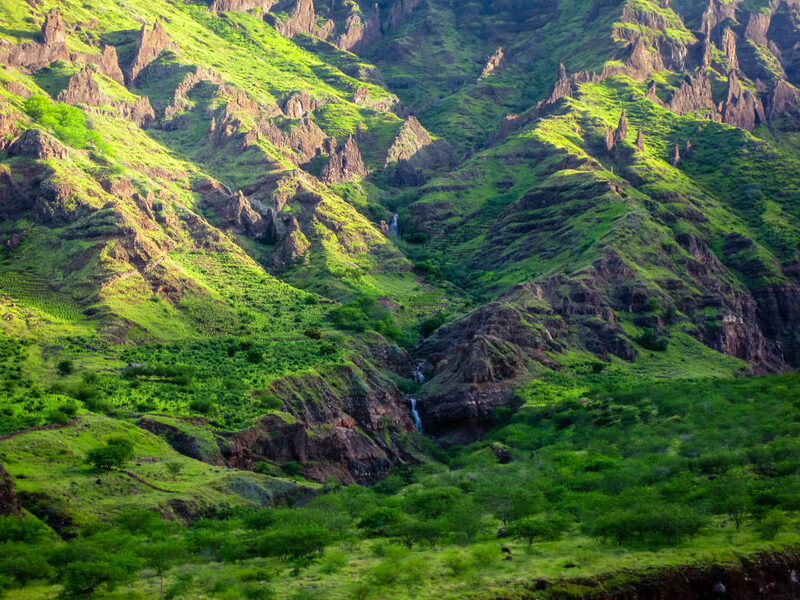 The land is flowing with waterfalls and lush green fields of sugar cane (at least in the wet season); the towering mountains provide epic views of the Atlantic Ocean and neighboring islands; and the colorful markets are bustling with movement, music, and friendly exchanges. Ribeira das Patas, Cape Verde on the island of Santo Antao. 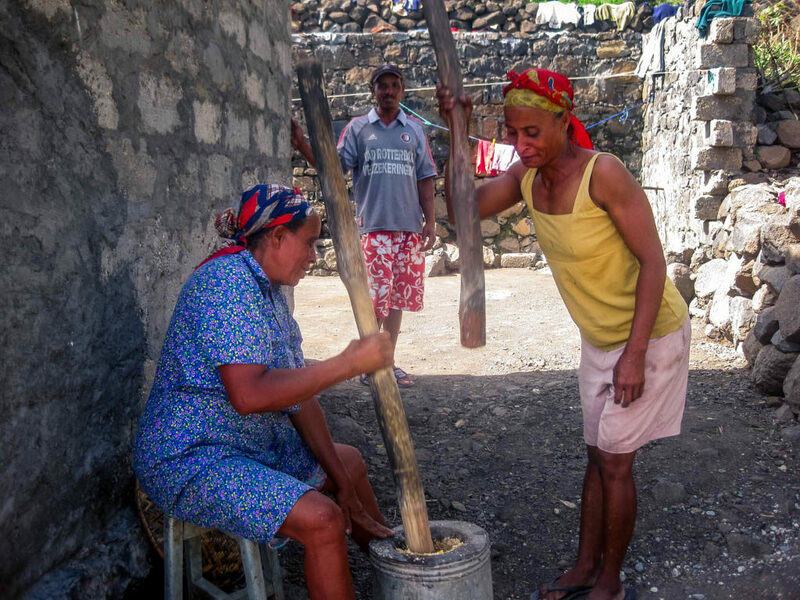 The island nation is known for all of these things, but above all else, Cape Verde is known for its morabeza, or its hospitality. Having lived there for two years, I cannot count the number of times that strangers have invited me into their homes for sumo and bolacha (juice and cookies). I love to hike, and every home I would pass, women would be standing in their doorways waving and smiling telling me to “Entra!”, or enter. They are so excited to share their culture and food with strangers. Then again, they all told me I was too skinny, so it might have been out of genuine concern that they wanted to feed me so much. I remember one instance specifically, I was walking down a path and encountered a farmer on his way home with a basket of mangos on his head. He greeted me enthusiastically, and after a brief conversation, he insisted that I take a bagful of mangos home with me. He refused to yield to my courteous protests. I was so moved. As a farmer, this produce is his livelihood, yet he is so generous to give his mangos to a complete stranger. It was certainly a lesson in humility and generosity. Cape Verde is truly a beautiful county. I know I have already said that, but I cannot express it enough. If you have the chance, do make sure you visit and experience both the food and morabeza for yourself. Traveling to Cape Verde soon? 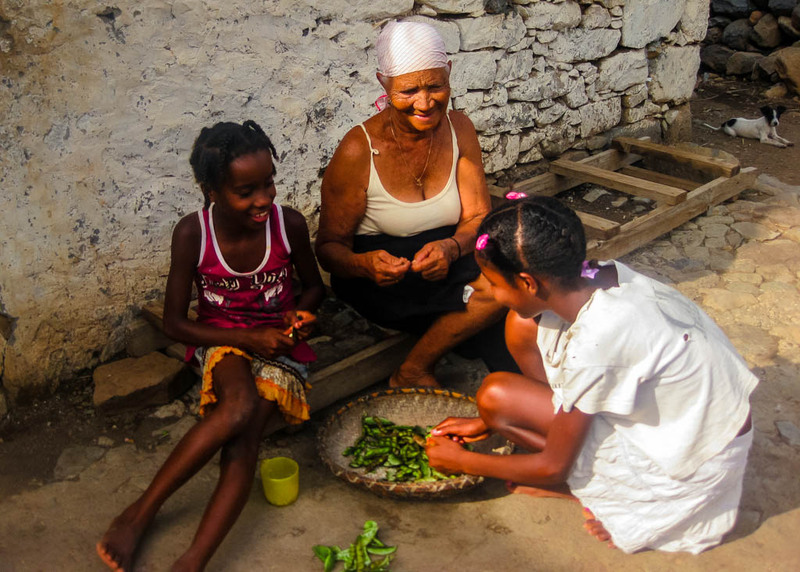 Be sure to take a peek at our Guide to Cape Verdean Creole (Kriolu). Nothing compares to Cape Verdean morabeza. What a awesome experience and the food looks great! Some dishes resembles a lot to what my Colombian grandma makes! I actually don’t think I have tried too many authentic Colombian dishes. Also, isn’t it funny how our grandmas always seem to make the best food? 🙂 Well grandmas and moms anyway. Nothing beats home cooking! that’s some interesting food choices. Banana in fish soup..hmm! The fried stuff look tasty though! Haha they are the unripe green plantains so they don’t have too much flavor compared to super sweet yellow bananas. It sounded strange to me at first too, but somehow it works! Cape Verdean food, I never knew what I was missing out on! The feijoada sounds perfect for me! Oh my goodness, Cape Verdean food is delicious. Very tasty and very filling! Very interesting dishes! Never been to Cape Verde but I know lots of Portuguese people who went there and really enjoyed the food, thanks for sharing!